One day after setting the all-time record with her first win of the season, Sara Takanashi has extended it in Sunday's ski jumping finale with her 55th World Cup victory. OBERSTDORF, Germany — One day after setting the all-time record with her first win of the season, Sara Takanashi extended it in Sunday's ski jumping finale with her 55th World Cup victory. The four-time World Cup winner from Japan, who ceded her season title to Maren Lundby of Norway, soared 99.0 and then 102.5 meters to earn top points for both, finishing with 250.4 to beat Daniela Iraschko-Stolz by 11.6 points and Lundby by 19.4. 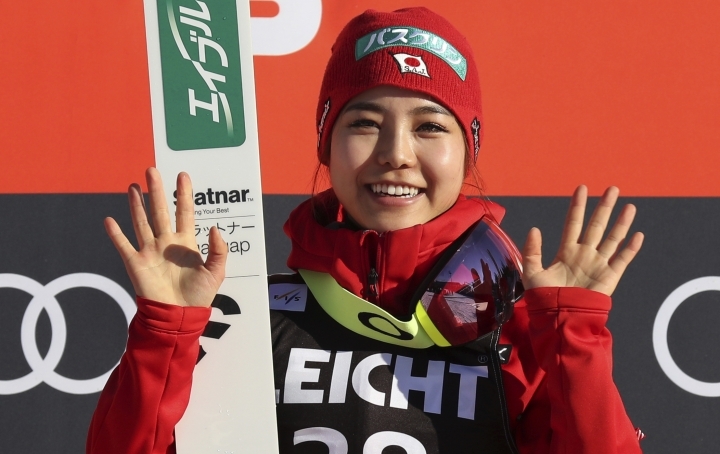 It was Takanashi's sixth consecutive win in Oberstdorf, and the same 1-2-3 podium finish as the day before. Takanashi overtook Gregor Schlierenzauer's 53 wins on Saturday to become the ski jumper with the most all-time victories. Schlierenzauer still holds the men's record. Lundby, the Olympic champion, brought her season tally to 1,340 points, finishing ahead of Germany's Katharina Althaus on 928 and Takanashi on 916. Another Japanese athlete, Yuki Ito, was fourth on 661, ahead of Russia's Irina Avvakumova on 575.